Eugene's Pet Wash has a stocked pet supply vending machine that sells dog treats, towels, and ponchos. 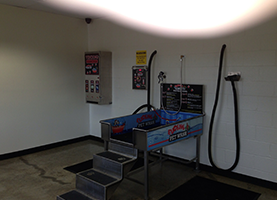 Eugene's Pet Wash has several service options such as tearless shampoo, conditioner, and pet deodorizer. Eugene's Pet Wash is located in Odessa, TX. They offer self-service dog washing, and they have a dog vending machine. Customers can come in and pay $5.00 for seven minutes of washing time, which allows them to shampoo, condition, blow dry their dog, and more. Dog lovers can also vacuum their pooch, and they can even use the dog fragrance spray. Eugene’s Pet Wash is very affordable and it is cash only. 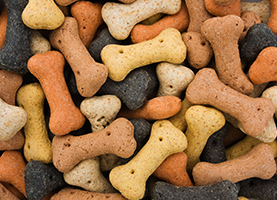 While customers are trying out the self service pet washing system, they can also purchase items from the pet supply vending machine, such as ponchos, towels, and dog treats. They have everything needed to thoroughly wash a dog. Do it yourself dog washing is more affordable than professional grooming services, and it avoids the difficult task of washing a dog at home. Washing a dog in a family bathtub can often result in scratches to the tub, and sore knees and stress on the back. 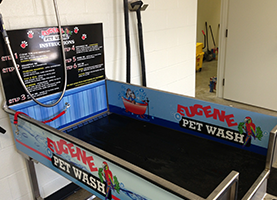 Eugene’s Pet Wash system tubs are waist high so there is no stretching and straining. Eugene’s Pet Wash gives people the tools they need to make their dogs smell great, and there is no need to chase a dog down or clean the bathroom ceiling after a bath is over. Pet owners can choose from tub disinfectant, flea and tick wash, a vacuum, tearless shampoo, conditioner, rinse water, pet deodorizer, and a powerful blow dryer. There is also a vacuum to remove excess water and loose hair. Eugene’s Pet Wash can be a fun activity for you and your family, and washing your dog is good for its health and appearance. Visit them to try self service dog washing and pet vending machines.